We've known for some time that a “pure GNOME” version of Ubuntu Linux was in the works, and following last week's release of Ubuntu 12.10 “Quantal Quetzal,” the first GNOME Remix of the software has now made its debut as well. Now offering a compelling new alternative for Ubuntu fans who are not so fond of the Unity interface that's now used by default in Canonical's popular Linux distribution, the new Ubuntu GNOME Remix is definitely worth a closer look. Here's a rundown of what you'll find. Both GNOME 3 and Unity have seen their share of controversy, of course, but the former is certainly more widely used. First and foremost in this new Ubuntu flavor is that it includes GNOME 3.6 rather than the Unity desktop. 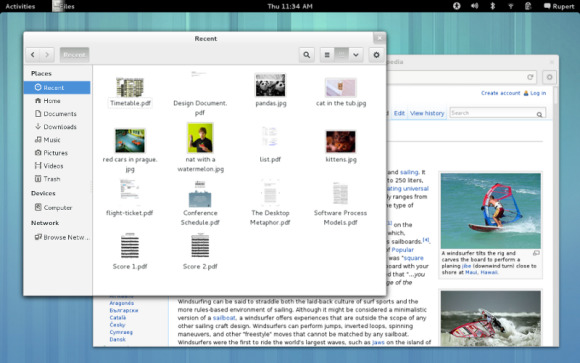 Included in this GNOME version (pictured above) are a reworked Activities Overview, updated message tray and notifications, and an enhanced Files application, among many other features. “Among other improvements, the login and lock screen have been redesigned,” the project team notes. GNOME Classic (gnome-panel 3) is also included, but GNOME Shell is the default for users whose hardware supports it. Much like Ubuntu itself, the GNOME Remix includes a variety of bundled apps, including the Epiphany browser, the Evolution email client, Abiword for word processing, Gnumeric for spreadsheets, Gwibber for microblogging, the Rhythmbox music player, Shotwell for photo management, and the Cheese webcam app. Last but not least, Tweak Tool and dconf Editor are provided in Ubuntu GNOME Remix for customizing advanced settings. Ready to give Ubuntu GNOME Remix a spin? You can download it for free from the Ubuntu Wiki site.